Winter bluebirds have a habit of surprising Mainers all over the state. Thanks, Jean. Winter bluebirds have a habit of surprising Mainers all over the state. They are hardier than folks expect. We sometimes see them in winter for the exact same reason we see American robins in winter. Bluebirds and robins are both members of the thrush family, a group of medium-sized songbirds that enjoys a varied diet gleaned on or near the ground. In Maine, they include hermit, Swainson’s, Bicknell’s and wood thrushes, as well as veeries. All of the latter birds are brown with spotted breasts. The bluebird is the dandy of the family. In summer, thrushes prey primarily on insects and worms, supplementing their diet with a helping of fruits and berries. In winter, most thrushes flee to the tropics. Central America is the destination for Swainson’s and wood thrushes. Veeries go all the way to South America. The Bicknell’s thrush confines itself to just a few island forests in the Caribbean. Hermit thrushes, American robins and eastern bluebirds are surprisingly cold-tolerant. Hermit thrushes need a modest helping of insect prey, so they go a little bit south, but not far. A few will actually winter here, surviving on berries and vegetative matter. Seeing one on a Maine winter day is a surprise, but not a total shock. Robins and bluebirds can subsist on berries alone for long periods. In fact, robins eat a lot of berries even in summer. Certainly we have been seeing more winter robins in Maine over the past couple of decades. That’s partly due to climate change, but it’s also due to our tendency to plant a lot of backyard ornamentals that retain berries all winter. It is also true that many of our robins go south, while other Canadian-breeding robins migrate here in winter, replacing them. One reason we’re seeing more bluebirds in winter is that we’re seeing more bluebirds in summer. Among all the New World thrushes, only the bluebird is a cavity nester. For much of the past century, their numbers declined precipitously. It was a period when we pruned trees to get rid of knotholes in our orchards and wood lots. It was a period when invasive species competed for the remaining cavities. House sparrows introduced from Europe were particularly guilty of taking over bluebird cavities, but European starlings took a toll, too. 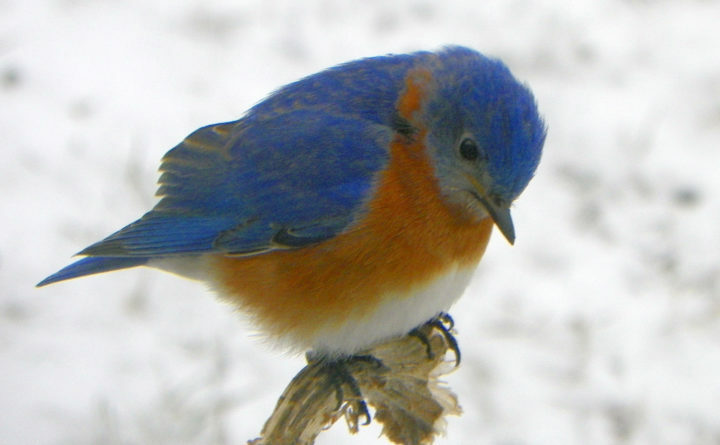 In the 1960s and ’70s, volunteers began a concerted effort to put out bluebird boxes. This helped restore bluebird numbers. The hole in a human-crafted bluebird box can be sized to exclude the larger starlings. Other restoration efforts dealt with house sparrows in a more lethal way. Bluebirds have always been quick to return to Maine in early spring. They begin to stake out territory and woo mates while there is still snow on the ground. One quirky mating habit: A male bluebird will find an appropriate cavity and entice a mate by bringing nesting materials to it. He will show her his stuff and strut his stuff, and … that’s it. She does all the work of actually building the nest and incubating the eggs. Thrushes do not visit bird feeders, but there is an exception. Bluebirds like mealworms. Their preferred habitats are field edges, blueberry barrens, parks and golf courses, so they won’t come into a small backyard. But mealworms on a platform feeder at the edge of an open expanse might lure one in. I expect we will continue to see more winter bluebirds as the planet warms, and that’s not all. Many southern birds have already moved north, and I am ready to make a prediction. Soon, turkey vultures will be winter birds in Maine. It used to be that vultures were not in the state at all. They started expanding northward about 50 years ago. But they always left for the winter, not returning until late March. Lately, I’ve had to visit Massachusetts several times, and not just to celebrate the New England Patriots. On every single trip, I’ve seen them along I-95 in Portsmouth. It’s only a matter of time before they begin wintering north of the Piscataqua River.